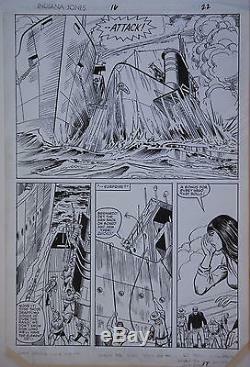 HERB TRIMPE / VINCE COLLETTA original art, INDIANA JONES #16 pg 22, 11x16, UBoat. HERB TRIMPE / VINCE COLLETTA original art, INDIANA JONES #16 pg 22 (unSigned).. Name of Comic(s)/Title? Publisher or Artist : Marvel Comics / Herb Trimpe and Vince Colletta.. Some notes in the margins.. Size : (approx) 11" x 16"... For this Original piece of art! Lots more ORIGINAL ART, MOVIE/TV, & MARVEL items in our store. Be sure to check out all of our current on-going auctions! Check out the scan(s). Then check out our other auctions Here! Be sure to check this out! We guarantee Absolute Satisfaction on All Orders! The item "HERB TRIMPE / VINCE COLLETTA original art, INDIANA JONES #16 pg 22, 11x16, UBoat" is in sale since Saturday, January 30, 2016. This item is in the category "Collectibles\Comics\Original Comic Art\Interior Pages". The seller is "hqcomics" and is located in California. This item can be shipped to United States, Canada, United Kingdom, China, Mexico, Germany, Japan, Brazil, France, Australia, Russian federation, Denmark, Romania, Slovakia, Bulgaria, Czech republic, Finland, Hungary, Latvia, Lithuania, Malta, Estonia, Greece, Portugal, Cyprus, Slovenia, Sweden, South Korea, Indonesia, Taiwan, South africa, Thailand, Belgium, Hong Kong, Ireland, Netherlands, Poland, Spain, Italy, Austria, Israel, New Zealand, Philippines, Singapore, Switzerland, Norway, Saudi arabia, Ukraine, United arab emirates, Qatar, Kuwait, Bahrain, Croatia, Malaysia, Chile, Colombia, Costa rica, Panama, Trinidad and tobago, Guatemala, El salvador, Honduras, Jamaica.